JVC DLA-X9900 4K HDR THX 3D Home Theatre Projector along with 1,600,000 : 1 Dynamic Contrast ration and 2,000 Lumens brightness, now features new e-shift5 Technology, dramatically improving picture quality to its predecessor. You can now enjoy high-quality pictures more precisely and smoothly, video game with high-bandwidth signal are now processed precisely with low Latency. Adjust your personal tone, brightness and darkness preferences over HDR pictures. The newly upgraded model for 2018, DLA-X9900 is a premium custom install projector, built with hand-selected and hand-tested components. The projector delivers 2000 lumens and an industry leading 160,000:1 native contrast ratio for strikingly clear images with screen sizes over 150 inches, and/or in high ambient light environments. No matter the room setting, the DLA-X9900 delivers dramatic, reference quality images from all 4K and HD sources. 18Gbps 4K Signal input/HDCP 2.2. Real Colour Imaging Technology. 12-point Manual Gamma Adjustment. MaxCLL & MaxFALL Mastering Dara Display. THX 3D Display Certification. 2000 Lumens with High Power Lamp (PK-L2615U). 265W High / 200W Normal. 160,000:1 Native Contrast Ratio. Intelligent Lens Aperture increases dynamic contrast ratio to 1,600,000:1. 6th generation 0.7-inch D-ILA devices. E-shift5 4K Precision 3840 X 2160 Projected Image. Dual Full Speed 18Gbps HDMI/HDCP 2.2 Compatible Inputs. Compatible with full spec native 4K signals such as 4K60p 4:4:4 4K60p 4:2:2/36bit and 4K24p 4:4:4/36bit. Compatible with 4K streaming devices and UHD BD content. Compatible with DCI Color Space. Advanced HDR (High Dynamic Range) usability with brighter, more detailed HDR content. Multi Pixel Control (MPC) with Auto Mode for ease of use. MPC works with 4K60P (up to 4:4:4) signals. Clear Black processing (Patent pending). Reduces gaming/PC frame delays. Motion Enhance (2D, 3D, 4K) with Clear Motion Drive. ISF (Imaging Science Foundation) Licensed Quality installers can calibrate projector to your room. SRGB, DCI and x. Darkness and lightness correction. Lens memory function memorizes 10 positions for focus, zoom and shift. Maintains constant height for 2.35, 1.85, 1.78 on same screen. Screen Mode Presets for different screen material (117 memory positions). Convergence Correction – 1/16th Pixel Increments (2 memory positions). Simplified 6-Axis Color Management System. Manual Gamma Control included with JVC Calibration Software 6. Control4 SDDP (Simple Device Discovery Protocol). Stunning 3D Performance with RF active shutter glasses (optional). Advanced 3D Crosstalk Cancellation Control. Parallax adjustment for fine tuning 3D effect. Accepts all modern 3D formats (Blu-ray, side-by-side, top-and-bottom). Optimum Flexibility and Convenience. Remote control via LAN, RS-232C, IR. 12V Screen Trigger Output. V: 80%/H: 34% motorized lens shift. 1.4:1 to 2.8:1 lens throw. The item “JVC DLA-X9900 4K HDR THX 3D Home Theatre Projector BLACK Brand New” is in sale since Wednesday, October 25, 2017. 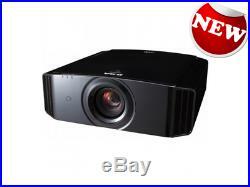 This item is in the category “Home Entertainment\DVD, Blu-ray & Home Cinema\Projectors”. The seller is “grabit_sales” and is located in Melbourne. This item can be shipped worldwide.